Are the United States and China on a collision course? In October 2008, a month after the collapse of Lehman Brothers—with the United States’s financial system seemingly about to buckle and Washington in desperate need of cash to prevent a total economic collapse—a State Department official contacted his Chinese counterpart about China buying U.S. securities. To his surprise, the Chinese, who had previously displayed an insatiable appetite for U.S. Treasury bills, suddenly balked at lending a hand. The reason, the Chinese official said, was the recent announcement of an impending sale of U.S. armaments to Taiwan. This not-so-subtle threat, detailed in a memo released by Wikileaks, turned out to be a bluff, but it signaled a striking shift in the tone and content of Chinese foreign policy. Over the course of the past two years, Beijing has adopted a more assertive posture in its dealings with Washington, as well as with many of America’s allies in Asia. Among other things, China has threatened for the first time to impose sanctions on U.S. companies involved in arms sales to Taiwan; intensified its claims to virtually all of the resource-rich South China Sea; and conducted its largest-ever naval exercises in the Western Pacific. America’s “China hands” have long attributed any tensions between the two countries to misunderstandings or readily correctable policy errors. But with the passage of time it has become increasingly apparent that the differences between China and the United States spring from deeply rooted sources and aren’t likely to be resolved anytime soon. Indeed, as recent events suggest, it appears that the two nations are in for a long, tense, perhaps even dangerous struggle. And, most disconcerting of all, it’s a struggle in which, at least for the moment, China seems to be gaining the upper hand. If you look back over the last 2,500 years—from the days of Athens and Sparta through the cold war—there has inevitably been mistrust, rivalry, and often open conflict between leading global powers and rising states that seek to displace them. In these scenarios, the leading power has wanted to preserve its privileges, while fearing that emerging challengers would seek to overturn the international order that it dominates. Rising powers, for their part, chafe at hierarchies of influence that were put in place when they were relatively weak. Much of the tension in today’s U.S.-China relationship is a reflection of this familiar dynamic. But this tension is exacerbated by an additional factor that has only sometimes been present in great power rivalries of the past: deep ideological differences. One often hears it said that, because China is no longer truly a communist country, ideology has ceased to be a factor in its relations with the United States. This misses the point. Today’s Chinese leaders may no longer be anti-capitalist Marxists but they govern as Leninists and, as such, are determined to preserve the Communist Party’s exclusive monopoly on political power. China’s rulers see the United States as intent on spreading its brand of democracy to every corner of the earth. For their part, the American people continue to eye with suspicion a regime they see as repressive and autocratic. Ideology may not be sufficient, in itself, to provoke conflict between the United States and China, but it aggravates and amplifies the geopolitical tensions between the two. This backdrop of great power rivalry and sharp ideological disagreement helps to explain U.S. policies toward China and Chinese policies toward the United States. In contrast to the cold war strategy of containment, America’s strategy for dealing with China has never been codified in official documents or given a name. But over the past two decades, roughly the same strategy has been employed by both Republicans (Bush 41 and Bush 43) and Democrats (Clinton and now Obama). Broadly speaking, the aim has been to discourage Beijing from seeking to challenge America’s interests and those of our allies in Asia, while at the same time nudging China toward democracy. To accomplish these ends, American policymakers have employed a dual approach. On the one hand, they have sought extensive economic and diplomatic engagement with China. The hope has been that these interactions will “tame” China by giving it a stake in the existing international order—and, over the long run, encourage the growth of a middle class and the spread of liberal values, thereby pushing the country gently and indirectly down the path toward democracy. At the same time, Washington has worked to preserve a balance of power in East Asia that is favorable to its interests and those of its allies. This began in earnest following the Taiwan Straits crisis of 1995-1996, when Beijing test-fired missiles in an attempt to influence the outcome of Taiwanese elections, and the Clinton administration dispatched two aircraft carriers in response. Since then, the United States has taken steps to strengthen its military capabilities in the region, while solidifying bonds with partners old (South Korea, Japan, Australia) and new (India). China’s strategy for dealing with the United States developed somewhat more deliberately. In the wake of Tiananmen Square and the collapse of the Soviet Union, China’s leaders recognized that the previous rationale for cooperation with the United States no longer applied. They feared that, having toppled one communist giant, the Americans would turn their attention to the other. Surveying the scene in 1991, Deng Xiaoping circulated a brief memo to his top party colleagues. The essential message of the so-called “24 Character Strategy” was that China had little choice but to “hide its capabilities and bide its time.” That meant avoiding confrontation with other states, especially the United States, while working to build up all aspects of its power—economic, military, technological, and political. Recently, Chinese foreign policy has taken on a more assertive tone; but its overall aims have not changed much in two decades. Above all, the current regime wants to preserve indefinitely the Chinese Communist Party’s grip on political power; it seeks, in effect, to make the world safe for continued CCP rule. In part for this reason, China’s leaders want to restore their country to its place as the preponderant regional power. This requires reducing the influence of the United States in East Asia, constricting its presence, and perhaps eventually extruding it from the region. Chinese officials allude to this objective with varying degrees of subtlety. When I worked in the Bush administration from 2003 to 2005, I had several conversations with Chinese diplomats in which they said, almost in passing, that, while the United States might be a Pacific power, it was, of course, not an Asian power. Rather more bluntly, in 2007, a Chinese admiral reportedly told his American counterpart that their two countries should divide the Pacific between them, with China taking everything west of Hawaii. China’s recent obstreperousness may yet backfire, frightening the United States and its Asian partners into doing more to balance against its growing power. For now, however, the alarming news is that China’s strategy seems to be working much better than America’s. Washington has made basically no progress in pushing China toward democracy, nor has it succeeded in persuading Beijing to abandon ambitions—like controlling the entire South China Sea—that threaten the interests of America’s allies. For its part, China’s Communist Party remains firmly in command. Meanwhile, as China’s economy and military have matured, it has begun to mount a serious challenge to America’s position in Asia. Beijing has now become the most important trading partner for the advanced industrial nations of Northeast Asia and Australia, as well the comparatively poor countries on its frontiers. It is a leading investor in infrastructure development and resource extraction across the region. These thickening commercial ties have already begun to complicate calculations of national interest in various capitals. 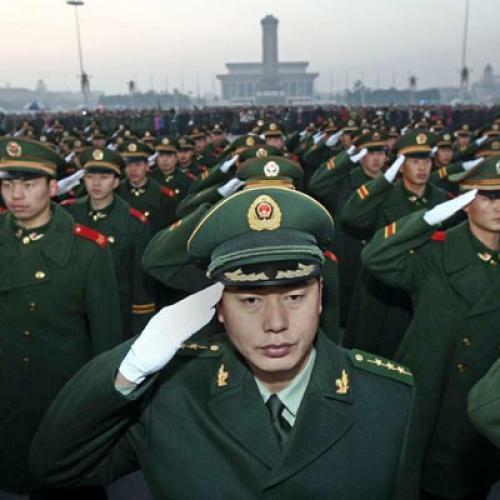 China’s rapid economic growth has also enabled a substantial expansion in military spending. And Beijing’s buildup has begun to yield impressive results. As of the early 1990s, the Pacific was, in essence, a U.S. lake. Today, the balance of military power is much less clearly in America’s favor, and, in certain respects, it has started to tilt toward China. While its arsenal remains comparatively small, Beijing’s ongoing deployment of intercontinental ballistic missiles will give it a more secure second-strike nuclear capability. Washington’s threat to use nuclear weapons, if necessary, to counter Chinese aggression against its allies is therefore dwindling toward the vanishing point. As happened during the cold war, once the Soviets achieved a form of nuclear parity, the burden of deterrence will fall increasingly on the conventional forces of the United States and its allies. And, here, the trends are, if anything, more worrisome. Since the mid-1990s, China has been investing heavily in so-called “anti-access” capabilities to deter or defeat American efforts to project power into East Asia. People’s Liberation Army (PLA) strategists appear to believe that, with enough highly accurate, conventionally armed ballistic and cruise missiles, they could, in the event of a confrontation, deny U.S. forces the use of their regional air and naval bases and either sink or push back the aircraft carriers that are the other principal platform for America’s long-range power projection. If the PLA also develops a large and capable submarine force, and the ability to disable enemy satellites and computer networks, its generals may someday be able to convince themselves that, should push come to shove, they can knock the United States out of a war in the Western Pacific. Such scenarios may seem far-fetched, and in the normal course of events they would be. But a visibly deteriorating balance of military power could weaken deterrence and increase the risk of conflict. If Washington seems to be losing the ability to militarily uphold its alliance commitments, those Asian nations that now look to the United States as the ultimate guarantor of their security will have no choice but to reassess their current alignments. None of them want to live in a region dominated by China, but neither do they want to risk opposing it and then being left alone to face its wrath. When he first took office, Barack Obama seemed determined to adjust the proportions of the dual strategy he had inherited. Initially, he emphasized engagement and softpedaled efforts to check Chinese power. But at just the moment that American policymakers were reaching out to further engage China, their Chinese counterparts were moving in the opposite direction. In the past 18 months, the president and his advisers have responded, appropriately, by reversing course. Instead of playing up engagement, they have been placing increasing emphasis on balancing China’s regional power. For example, the president’s November 2010 swing through Asia was notable for the fact that it included stops in New Delhi, Seoul, Tokyo, and Jakarta, but not Beijing. This is all to the good, but it is not enough. The United States cannot and should not give up on engagement. However, our leaders need to abandon the diplomatic “happy talk” that has for too long distorted public discussion of U.S.-China relations. Washington must be more candid in acknowledging the limits of what engagement has achieved and more forthright in explaining the challenge a fast-rising but still authoritarian China poses to our interests and those of our allies. The steps that need to be taken in response—developing and deploying the kinds of military capabilities necessary to counter China’s anti-access strategy; working more closely with friends and allies, even in the face of objections from Beijing—will all come with steep costs, in terms of dollars and diplomatic capital. At a moment when the United States is fighting two-and-a-half wars, and trying to dig its way out from under a massive pile of debt, the resources and resolve necessary to deal with a seemingly distant danger are going to be hard to come by. This makes it all the more important that our leaders explain clearly that we are facing a difficult long-term geopolitical struggle with China, one that cannot be ignored or wished away. To be sure, China’s continuing rise is not inevitable. Unfavorable demographic trends and the costs of environmental degradation are likely to depress the country’s growth curve in the years ahead. And this is to say nothing of the possible disruptive effects of inflation, bursting real-estate bubbles, and a shaky financial system. So it is certainly possible that the challenge posed by China will fizzle on its own. But if you look at the history of relations between rising and dominant powers, and where they have led, what you find is not reassuring. In one important instance, the United States and Great Britain at the turn of the twentieth century, the nascent rivalry between the two countries was resolved peacefully. But in other cases—Germany and Britain in the run-up to World War I, Japan and the United States in the 1930s, and the United States and the Soviet Union after World War II—rivalry led to arms races and wars, either hot or cold. What saved the United States and Britain from such a clash was in part the similarity of their political systems. What made conflict likely in the latter scenarios were sharp differences in ideology. And so, unless China undergoes a fundamental transformation in the character of its regime, there is good reason to worry about where its rivalry with the United States will lead. Aaron L. Friedberg is a professor at Princeton University and the author of the forthcoming book A Contest for Supremacy: China, America, and the Struggle for Mastery in Asia. This article originally ran in the May 26, 2011, issue of the magazine.